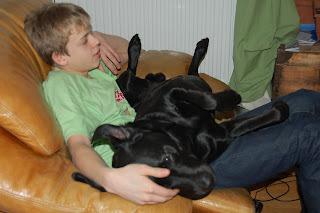 Jonah decided the other day when there was a storm coming, that the safest place to be was on the sofa!! Problem was, I was already on the sofa, so he reckoned if he didn’t look at anyone then we wouldn’t tell him off, silly dog. This is another example of not being on the sofa, apparently in this case he was technically on top of the boy who was on the chair, rules in this house are for breaking, pushing, stretching, sheesh!!!! Looks pretty comfy and relaxed though!! Oh Jonah is so adorable! I love the look of his face and the pictures of him spralled all out on your son! I think it’s good to be a dog, because the only person who would let me sprawl across them, like Jonah is doing to your son, is my husband. On the other hand, if one of my dogs wanted to do that, they’d have a number of laps to choose from. I even feel jealous when one of the dogs does that to someone else instead of me! I think it’s those lovely brown eyes that just make us melt.